Starting at American Pro Dive Center for the Rainbow River tour the snorkelers and divers follow the guide through a neighboring small town to a beautiful wooded area just north of the shop. Loading the gear on the boat is made easy and the view along the waters edge is unbelievable especially to anyone who lives in the city. The fresh air alone just relaxes your thoughts and worries of usual day to day grind. The trees along the shore make home for birds and a beautiful backdrop for this setting. Traveling up river and looking over the side of the boat you may see several types of fish, turtles, and even the occasional otter. Learning about facts and background history of the Rainbow River from your Captain adds interest to the boat ride. 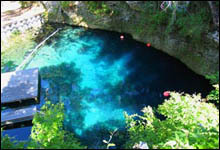 The Manatee Springs dive offers two dive sites at this location. The first is hidden away with little lilly pads called duckweed covering the surface. Once on your descent the bubbles from your regulator open holes in the ceiling for the suns rays to give a beautiful colorful atmosphere. 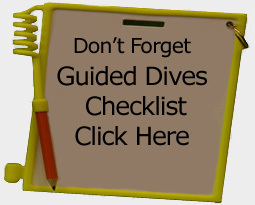 Don't forget the camera, the cavern and the clear springs that makes this 60 foot dive memorable. After swapping out tanks, start the excitement with the spring propulsion ride! This spring has a depth of 40 feet and a high flow spring vent. Fin kicking to the outflow and when you stop the strength of this florida spring glide you with the outflow. The varieties of fish and turtles will excite the diver or snorkeler. The Blue Grotto Dive in Florida is guided by our divemaster and for all experience levels of divers because of its great visibility. Descend down the first 70 feet of open water to view a variety of fish, fossils in the limestone walls, and even a friendly turtle. Along the way at 30 ft check out the air bell that made this grotto dive famous. The bell is located on the ceiling of this cavern dive and is supplied with compressed air from the surface. Talk to your dive buddy underwater, this florida spring allows you to do just that. Don't talk to long because time in the air bell still counts toward your bottom time but the compressed air is free. Devil's Den is a most unique dive site. Florida's only underground prehistoric spring. 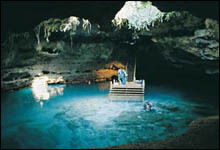 To enter, divers descend down into the earth by a short flight of stairs. Upon reaching the bottom, the echoes of water drops ring through the air cavern. 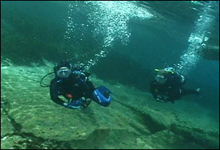 With steam rising from this florida spring, on cool days, gives atmosphere and reason how this dive site got its name. 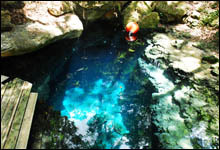 This is a 50 foot depth spring with many swim trough's, air pockets, and prehistoric fossils to excite even the most adventurous of divers. Don't forget the fish food because the catfish are huge and hungry. 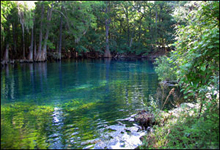 Like our other guided florida springs dives the water is a constant 72 degree and a 3mm wetsuit is needed. Paradise Springs, in Florida, is truly a dive oasis. This is a guided two tank dive into a prehistoric cavern. Imagine diving in a crystal clear underwater volcano, where the fossils are just a few feet underwater. This dive starts with a huge whale bone protruding from the cavern. Paradise Springs is a deep dive descending down to 105 feet at the bottom of the ballroom. Over time the water carved this room to look like a roman arena. 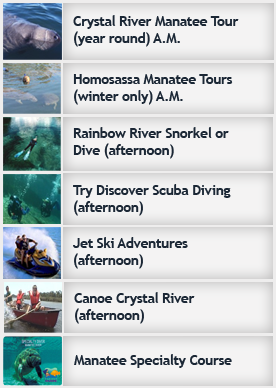 The Rainbow River is a shallow night dive option conducted year round. 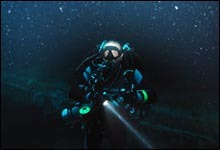 Divers not only enjoy the night life of this crystal clear spring system, but also a unique drift dive combined with the pleasure of seeing what your light illuminates. The inventory of animals that can be seen includes sunfish, bass, brim, speckled gar, bowfin, painted turtles, miniature snapping turtles, and soft-shelled turtles, as well. This nice, easy night/drift dive is truly a site that should be experienced.